The legend of St Fortunatus (which was probably written in the late 7th century) records that he was a priest at the church of Turrita (later Santa Maria di Turrita, south of Montefalco). He also worked as a farmer and was renowned for his charity to the poor. When he died (according to tradition in ca. 395), he was buried in a field in a place called “Agellus”, which seems to have later provided the site for San Rocco. The legend also records that, some 20 years later, St Severus, a military official from nearby Civitas Martana, stopped at the site of St Fortunatus’ grave en route to Ravenna, where he faced trial. He promised to build a church on the spot if St Fortunatus would secure his acquittal. He survived to keep his promise and duly built the first church on this site, which implies that the relics had already been moved here after their initial burial at Agello. Bishop Spes of Spoleto translated them the the altar of the new church, which he dedicated as San Fortunato. ✴a certain Andrea and his wife Casalina sold “petiam terre vincale in curtis castri Coronii, in loco qui dicitur Vagiano” (a piece of land in the court of the fortress of Coronii, in the locality called Vagiano) to Angolarlo, a judge at Coccorone, in 1204. San Fortunato became an important parish church, responsible for about 50 other churches. In 1050, the Emperor Henry III conceded some of its privileges to the Abbazia di Farfa, and it passed to the Abbazia di Sassovivo in 1082. The church passed to the Bishops of Spoleto in the 13th century, together with an adjacent fortress that probably stood on the site of the earlier Lombard palace. In 1320, the Rector of the Duchy of Spoleto requested the transfer of the complex from the Bishop of Spoleto. Pope John XXII confirmed the transfer in the following year, and ordered that the fortress should be rebuilt. The objective was to provided a more secure base for the papal administration, given the unrest in Spoleto. Work began under the new rector, Jean d' Amiel (1322-33), and a payment was recorded in 1324 to the architect Lorenzo Maitani for advice on the project. Work continued into the early 1330s on what became known as the Palazzo Vecchio (to distinguish it from Palazzo Nuovo, outside Porta San Clemente). Considerable sums were spent on it in 1355, after Cardinal Gil Albornoz regained papal control of the Duchy of Spoleto in 1355. 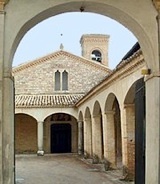 Bishop Filippo dell’ Antella of Florence (whom Pope Clement VI had appointed as rector of the Duchy of Spoleto in 1353) was documented in residence here on occasions in 1356-7. San Fortunato became the curial church of the Duchy of Spoleto and amassed a considerable income from the acquisition of surrounding parcels of land. However, its importance declined later in the century and its privileges passed to San Bartolomeo. Pope Boniface IX transferred some of its income to Ugolino III Trinci in 1386. The adjacent fortress, which was known as Rocca dell Pieve, was occupied by the Trinci Lords in 1438 and destroyed by the populace when the Trinci fell from power in 1439. [Surviving remains ?] The income that had been diverted to the Trinci family passed to Cardinal Latino Orsini, and Pope Martin V gave rights over the church to the Bennati family. At the time that the church passed to the Observant Franciscans (see below), Barnaba Bennati was its priest. The impetus for the establishment of a community of Observant Franciscans at San Fortunato seems to have come from Fr. Antonio da Montefalco, the Vicar of the Umbrian Province of this wing of the Order in 1442-5 and again in 1449-51. In 1444, Pope Eugenius IV granted his request to use the proceeds of a will in order to begin the project. There was some difficulty with Cardinal Latino Orsini and with the Bennati family, but in 1446 Eugenius IV mandated the bishops of Perugia and Gubbio (during a vacancy in the episcopal seat of Spoleto) to transfer the church to the Observants, along with the adjacent site on which they might build a convent. The Franciscans then extensively restored the church. Eugenius IV died a few months later, but Fr. Antonio was able to secure the support of his successor, Pope Nicholas V. The new pope commissioned the decoration of the Cappella Nicolina in the Vatican from Fra. Angelico and Benozzo Gozzoli in 1447, and Fra Antonio’s knowledge of this work probably inspired him to invite the latter artist to begin the decoration of San Fortunato in ca. 1450. In 1478, the Franciscan Pope Sixtus IV made the friars of San Fortunato responsible for the spiritual guidance of the Augustinian nuns of Santa Croce (later Santa Chiara). The ownership of the complex passed to the Commune in 1867, but it is still used by the Observant Franciscans. The plain sarcophagus that is now in the external loggia, to the right of the entrance to the church was documented in the orchard of the convent in 1871, when it was said to have originally contained the relics of St Fortunatus. The relics that it contained were officially recognised in 1740 and again in 1742. The sarcophagus and relics remained behind the wall of the Altare di San Fortunato (on the right side of the church) until 1829, when Bishop Giovanni Maria Mastia Ferretti of Spoleto removed them. The relics were transferred to a glass reliquary that was placed on the altar, where they could be more easily venerated. The sarcophagus (5th century) in front of the counter-facade, to the right of the entrance, came from the Cappella di San Severo (see below), apparently contained the relics of St Severus. A metrical Latin epitaph that identified it as such, which was transcribed in the 16th century but subsequently lost, probably dated to the 10th century. The damaged paintings in tondi of the Pietà and adoring angels against a background of fictive granite and porphyry are attributed to Benozzo Gozzoli. Although most of the original painting has been lost, the attribution is supported by the quality of the visible under-drawing. The church, which is set back in a courtyard, has a portico (15th century) that re-uses four Roman columns, two to either side of the central pilaster. These were presumably among the other Roman remains that have been discovered here over the centuries. This image of St Bernardino was painted very shortly after his canonisation by Pope Nicholas V in Rome in 1450. This fresco fragment in the loggia, to the right of the entrance to the church, was part of a larger decorative programme that is attributed to Tiberio d' Assisi. 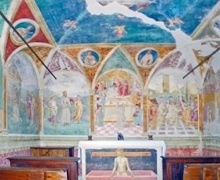 (He also decorated the Cappella delle Rose - see below). This monument is in the wall of the loggia, to the right of the facade of the church. The single nave of the church might well date to the 12th century. The apse seems to have been rebuilt on a higher level in the 14th century. The church took on its present appearance in the 17th century, when many important earlier frescoes were destroyed. The base of a Roman statue (ca. 100 AD), which was discovered in the 15th century in the valley below Trevi, was recorded in the 16th century as supporting the Altare di San Fortunato (see below). It bore an inscription (CIL XI 5054) commemorating Lucius Succonius Prisco, son of Lucius, who had held a number on important public offices in Trevi. It was presumably removed when the altar was rebuilt in the 17th century, and was documented in the 18th century, at which point it was embedded in the campanile. It was returned to Trevi in 1840 and is now in the Museo della Città e del Territorio there. ✴Part of a Madonna and Child enthroned with a musical angel survives to the right of the altar. The inscription at the base of the right side of the throne identifies the artist, Benozzo Gozzoli and the date. This polychrome wooden Crucifix hangs above the modern high altar. This altarpiece on the Altare di San Severo, which is on the left, opposite the Altare di San Fortunato, is attributed to Andrea Polinori. 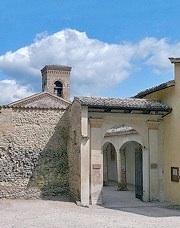 This chapel is in the courtyard, on the right as you leave the church. ✴the Pietà, on the altar frontal. This altarpiece from the high altar, which is universally attributed to Benozzo Gozzoli, was probably the first in Umbria to use a unified field for the main panel. The Commune gave it to Pope Pius IX in 1848 in exchange for an episcopal charter, and it is now in the Pinacoteca Vaticana, Rome. 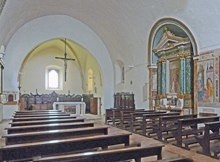 (There is a copy of the original on the left wall of the church). ✴SS Louis of Toulouse, Severus and Bernardino of Siena to the right. The predella depicts four scenes from the life of the Virgin. These panels, which were subsequently used to decorate a cupboard in the convent, were sold in 1945. One of them, which depicts the Crucifixion with saints, was re-discovered in 1960 in a private collection in Paris and attributed to Benozzo Gozzoli. The subject and present location of the matching panel is unknown. It seems probably that Fra. Antonio da Montefalco commissioned the diptych originally for his private devotions. ✴a frescoed backdrop of the Virgin, St John the Evangelist and two angels, with SS Mary Magdalene and Francis kneeling at the foot of the cross. It was documented in the 19th century in the convent. It almost certainly came from the church, but its original location here is unknown. It is now in the Pinacoteca. ✴The Crucifix has been attributed to a sculptor called Ponziano di Onofrio, on the basis of a signed statue (1484) of St Antony Abbot that Fra. Antonio da Montefalco commissioned for Santa Maria delle Grazie, Massa Martana. ✴The fresco is clearly by an artist from Foligno, perhaps Pietro di Giovanni Mazzaforte. A surviving document records payments made to Francesco Melanzio in 1495 for frescoes in the Cappella del Presepio, the 1st chapel on the left, which was then open to the exterior. This work was later lost when the walls were covered in plaster. The altarpiece is now in the Pinacoteca. As noted above, a funerary inscription (1st century BC) commemorating a lady called Varia was moved from San Fortunato to the Museo Civico in ca. 1930. This altar from San Fortunato is now in the Museo Civico. The steward Apulus dedicated it to the Manes Gods and to his friends Secia Apra and Sextus Caepias Hermetus.